Was it used as a ball? 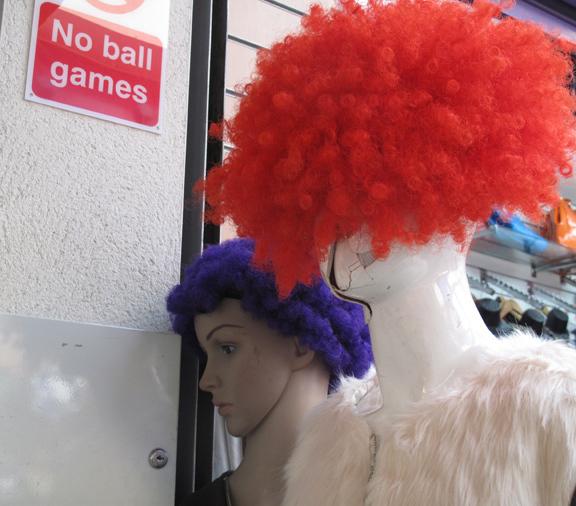 As I photographed these ‘heads’ a lady selling stuff in an arcade in Peckham shouted, ‘You should ask first!’ ‘Sorry,’ I said, ‘is it okay if I photograph them?’ Luckily she hadn’t spotted me adjusting the red wig. It entirely covered the model’s face which has been ‘scarred’ by some kind of an accident. Nothing to do but take it on the chin. This entry was posted in Peckham, Photography, Rye Lane, street photo, Writing and tagged arcade, mannequins, snap. Bookmark the permalink.